The National Basketball Association has banned Los Angeles Clippers owner Donald Sterling for life in the aftermath of his racist rants, which were recorded and distributed to the world. And while Humpty Dumpty's great fall has been in the books for mere minutes, marketers for the basketball franchise are already trying to put their brand back together again. They seem to be off to a good start with the We Are One static messaging—against a jet-black background—that's adorned the team's digital properties during the last hour or so. Visitors to the Clippers' website cannot click through. They cannot buy an overpriced Chris Paul or Blake Griffin jersey. All they can do is read those three words. "It's a powerful statement," said Ken Carbone, co-founder of the Carbone Smolan Agency, a branding shop in New York City. "Given all the heat, it's impressive that they've come up with this on the spot. It's all anyone has been paying attention to, so you don't need subtitles. It's a great, simple [reaction]." 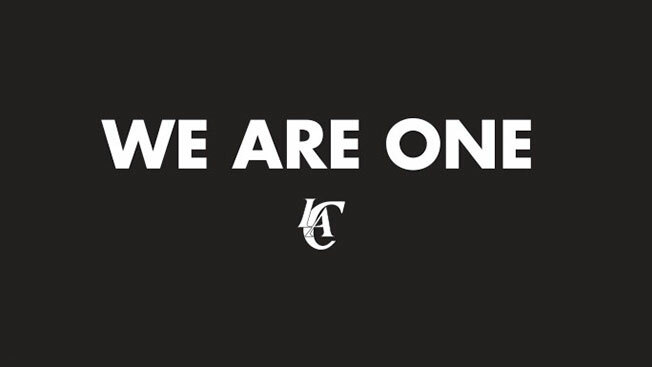 The same creative is also featured on the Clippers' Facebook and Twitter pages. And thanks to the social media era, the basketball squad's marketing effort—without any paid media—can make some headway. In fact, 16,000 Facebook users liked the image in its first hour. The creative was tweeted 50-odd minutes later, but garnered 863 retweets and nearly 600 favorites in its first six minutes. Folks around the nation—appalled by Sterling's egregiously offensive words—may be willing to separate the team brand from that man, yet it's probably too early to tell for sure. Per data from SponsorHub's XScore, which calculates digital/social media signals such as favorability and fan reaction, the Clippers' popularity fell 21.4 percent in the last five days. Though Bob Dorfman, a 30-year sports marketing veteran, creative director at Baker Street Advertising, and publisher of the Sports Marketers' Scouting Report, believes NBA commissioner Adam Silver's decisive action against Sterling will quickly go a long way in repairing the Clippers' brand among fans and sponsors alike. Social media can help, too, Dorfman said. "Ironically, what helped this story really take off in the first place—social—can now also help the situation heal," he remarked. But Dorfman raises a good question: What if the notoriously litigious Sterling fights the NBA and its owners in court and becomes a lingering problem for the brand? "It's going to be interesting to see if he goes quietly," he said. SponsorHub CEO Bob Johnston said that's the key piece of the story going forward in terms of how bad Sterling's been for the Clippers business. "The NBA managed to take care of things quickly and efficiently," Johnston said, "and if the owners vote to force Sterling to sell, and are able to do so quickly, the business ramifications and revenue loss will be relatively minor." And then we can go back to watching the Clippers' talented team, rather than talk about how their disgraced owner lay in a beck.